Humans are kind of story-propagating creatures. If you think of how we spend our days, think of all the time you spend on entertainment. How much of your entertainment centers around stories? Most pieces of music tell stories. Even hanging out with your friends, you talk, you tell stories to each other. They’re all stories. We live in stories. Like Indiana Jones, I really hate snakes, but this is an extremely cool photo. 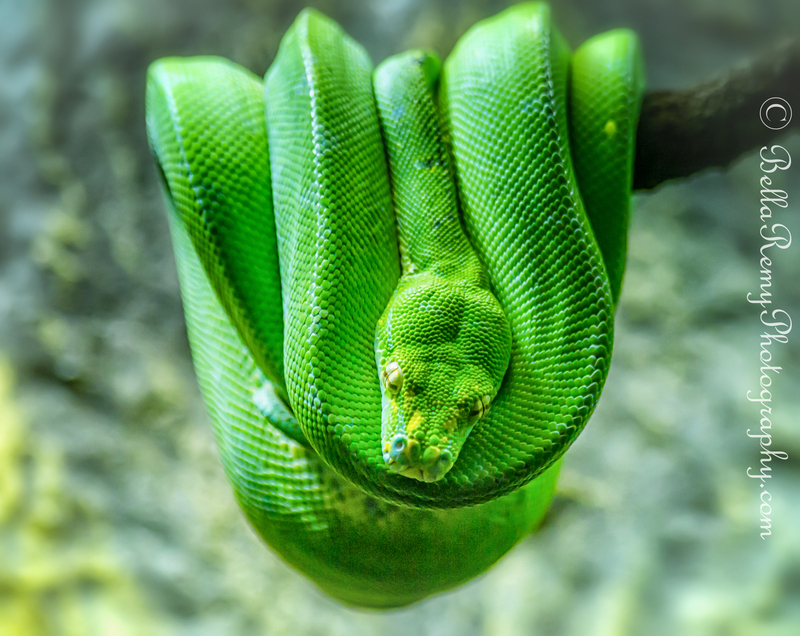 I was also thinking, if you ever see one of these in your yard, it sounds a lot better to say “there is a Morelia Viridis in our yard” than to say hey, its a green tree python! Great photo. I had never seen a snake hang on a tree like this. No way I wasn’t going to capture it. Oh, I love this. What a gorgeous snake. I must agree with you – even if I’m a snake hater. He is super cool. Oh my gosh, what a great shot!!!! You are so sweet ! I wish I could have done more with this scene, but did what I could. So happy you liked this one. What a great image this is! Thank you so much Lisa ! He really was just chilling there. I almost felt it was a model snake, not a real one. 🙂 I’m assuming you like snakes right? The green is special. Smart snake! If you’re going to live at an alligator farm, it’s best to blend in, right? 😉 What an awesome shot! You’re absolutely right ! Although he did have his designated room away from the gators. What a cool snake! I’m surprised that you photographed it though, knowing how much you dislike snakes. Thank you, Your Highness, I am deeply humbled. Wow – fabulous shot. Great color and texture! I usually do not think of snakes as beautiful – but this dude is colorful and handsome! I’m with you Renee. Snakes are…well…ICKY !! This guy was just way too cool not to appreciate. LOL ! Luckily he was in a glass cage and I did use a 300mm lens. He was sleeping anyway, didn’t move an inch. OMG NO ! Although I haven’t shared that I did zip lines over the alligator pits on this visit. It was fun! You know, I really want to like this, but it creeps me out, I hate snakes, they are so, so slimy. Great photo though, though I can’t look at it for too long. Hugs Leannne ! I’m with you..I hate snakes.they’re creepy, slimy, and devious. This guy is an exception for me. I’m finally back home today. It’s been a tough two weeks as you can imagine. uuuhh, i’m terrified of snakes! but i really like this picture! LOL ! Now you know I wouldn’t have shown a snake if he wasn’t cool right? I think all snakes are poisonous, so I’m with you my dear. Thanks! Beautiful – love the focus in the centre with the head and then softening around the edges. Thank you so much Jura ! BTW, I just wanted to click over and it said the blog didn’t exist? Did you stop posting? I loved visiting now and again seeing your part of the world.